Indian Army Soldier General Duty 2019 Syllabus Check Here. Indian Army Soldier Technical 2019 Syllabus Check Here. Indian Army Soldier Clerk/ SKT 2019 Syllabus Check Here. Indian Army Notification is out. Indian Army is recruiting for 100+ (Not Specified) Rally ARO Lansdown Online Form Posts. You can check Indian Army - Indian Army last date, download Indian Army notification, visit Indian Army official website and check other Indian Army Vacancy details.Complete Vacancy and recruitment Details about 100+ (Not Specified) Rally ARO Lansdown Online Form vacancies in Indian Army are provided below by JobSarkari.Com only for you. Last Date of Apply Online. 18/05/2019. Date of Admit Card (Through Registered E- Mail). 19/05/2019. Date of Rally. 03/06/2019 to 17/06/2019. Duty. Candidate Must Have Passed Class 10th With Minimum 33% marks in each subject with Overall Aggregate of 45% As Mentioned in Notification. 17 ½ to 21 Years 163. 48. 77-82. Duty (IDG). Candidate Must Have Passed Class 10th With Minimum 33% marks in each subject with Overall Aggregate of 45% As Mentioned in Notification. 17 ½ to 21 Years 157. 48. 77-82. Soldier Technical (Aviation/ Ammunition Examiner). Candidate Must Have Passed Class 12th in Science with Physics, Chemistry, Maths and English with 40% marks in each subject and 50% marks in overall aggregate. 17 ½ to 23 Years. 163. 48. 77-82. Soldier Nursing Assistant/ Nursing Assistant Veterinary. Candidate Must Have Passed Class 12th in Science with Physics, Chemistry, Biology and English with 40% marks in each subject and 50% marks in overall aggregate. 17 ½ to 23 Years. 163. 48. 77-82. Soldier Clerk/ Store Keeper Technical/ Inventory Management. Candidate Must Have Passed Class 12th With 50% Marks in Each Subject And 60% marks in Aggregate As Mentioned in Notification. 17 ½ to 23 Years. 162. 48. 77-82. Soldier Tradesman (10th Pass). Candidate Must Have passed Class 10th And having 33% marks in Each Subject. 17 ½ to 23 Years. 163. 48. 77-82. Soldier Tradesman (8th Pass). Candidate Must Have Passed Class 8th And Having 33% in Each Subject. 17 ½ to 23 Years. 163. 48. 77-82. 1.6 Kms. Group-I - 05 Minutes 30 Seconds. 6 Pull Ups - 16 Marks 1. Screening Medical Exam. 3. Candidates are Required to Fill All the Details Carefully Such As Name, Mobile No And E Mail ID And Save the Data on or Before 18th May 2019. 4. After Successfully Registration System Will Generate Registration No And Password. 5. Candidate Are Required to Log In And Complete The Process. 6. Candidate Have to Go on Given Address As Mentioned in Admit Card With Passport Size Photos on 03rd June 2019 to 17th June 2019. Q. 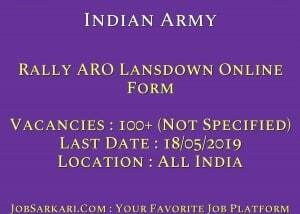 What is the Last Date For Indian Army Rally ARO Lansdown Online Form Vacancy ? A. Last Date for Indian Army Rally ARO Lansdown Online Form Posts is 18/05/2019. Q. What is the Form Type of Indian Army Rally ARO Lansdown Online Form Recruitment ? A. The Form Type for Indian Army Rally ARO Lansdown Online Form Posts is Online. Q. How many vacancies are available in Indian Army Rally ARO Lansdown Online Form Posts ? A. There are about 0 Vacancies in Indian Army Rally ARO Lansdown Online Form Posts.